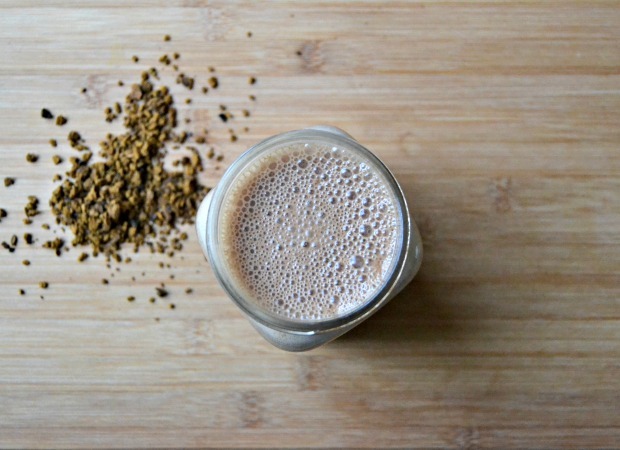 This is a delicious smoothie using the balancing action of the adaptogenic chaga mushroom. Chaga is a medicinal mushroom along the same lines as Reishi, Shiitake, and Cordyceps, amongst many others. It acts as an antioxidant, antiviral, anti-inflammatory, has anti-cancer properties, and helps to support the immune system. It’s wonderful for supporting the body at this time of year when we begin to transition from summer into fall and the colder months. When you brew this hearty tough mushroom, you wind up with a wonderful tea that nourishes your organs and your glands. Being an adaptogen, this does exactly what it says: it helps our bodies “adapt” to our inward and outward biological, chemical, and physical environments. Adaptogens also keep our stress hormones in check, preventing us from releasing more than we need in times of crisis and our fight or flight mode. Overall, adaptogens provide a balancing and calming effect on the whole body, especially the nervous and endocrine systems, allowing us to cope with the things life throws our way. Special care should always be taken when harvesting this mushroom. It’s always best to ensure that wherever you are purchasing your Chaga from, the company maintains practices that keep parts of the mushroom behind so the spores can repopulate and it may grow again. While you can just easily sip this as a warm or cold tea or make a delicious hot cocoa with it, adding it as the liquid base to your smoothie gives you a great dose of the little fungi too! Paired with raw cacao and plant-based protein it becomes a wholesome smoothie to optimally support your body. Add all ingredients to a high speed blender and blend until smooth. Enjoy! One of the things I was most looking forward to with finally studying holistic nutrition was delving into the solid facts about the things I have read. It’s easy to do a quick Google search about a certain vitamin or easily become confused about whether fats or healthy or not with all the information floating around out there but now I’m truly learning what this is all about. The dots are beginning to connect as knowledge flows through my classes into everyday life. One of the first classes I took was an introductory course into the fundamentals of nutrition. This was a great class led by a great teacher full of outside the box info on holistic health and gave a general overview of the basics of nutrition. Towards the end, we finally covered vitamins and minerals which I think are always a bit confusing as there’s so much out there to know. How many times have you gone to a health food shop only to leave feeling more overwhelmed than before you arrived? I want to highlight some of these on here and I wanted the first one to be one of my favourite minerals: Magnesium. There’s good reason as to why I love magnesium so much. It’s definitely worked its magic on my classmates and myself during stress-y periods of constant assignments, tests, and exams. How does magnesium do this exactly? Magnesium is one in the top three minerals that we tend to be deficient in (alongside iron and zinc). In today’s modern world, it’s hard to get enough of this from our soil alone as it’s very often depleted due to current farming practices. We also become deleted in this mineral by our fast paced lifestyles fuelled by caffeine and excess sugar. One way to make sure you’re getting what you can from a food source is to ensure you’re purchasing organic. Organic food comes from soil that is treated without the use of chemical fertilizers leaving you with more of the nutrients intact for your body to receive. A few sources to mention include organic brown rice, almonds, spinach, and chard. Magnesium is a natural relaxant and tranquilizer that helps to alleviate muscle spasms and tension. It’s also helpful in easing muscle cramps, PMS symptoms, anxiety, fatigue, insomnia, as a laxative, reducing stress, and as a prevention and treatment for heart attacks and heart disease. Just to name a few. It’s best to go for a complex (a blend of them all) this way you ensure you’re getting a well-rounded formula. My favourite way of getting more magnesium is actually through Epsom salt baths and magnesium spray. This is a really gentle way to ease into the benefits of this wonderful mineral. 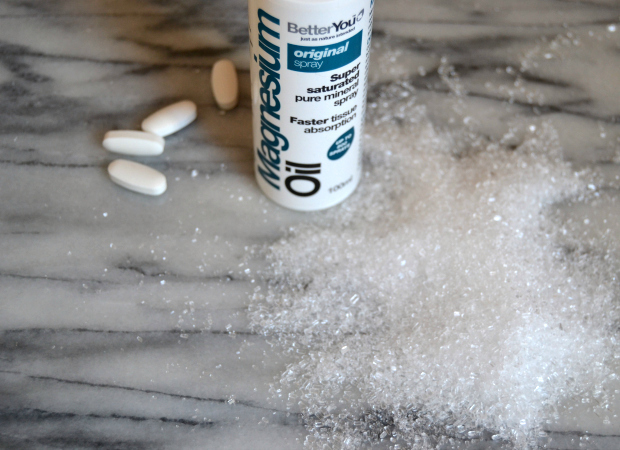 I find this is a great way to unwind in the evening: Have a bath filled with Epsom salts (I use minimum 2 cups) then spray the body while skin is still damp with magnesium spray so everything absorbs into your system for a rested and peaceful sleep. It truly does work wonders and I can say this as anyone who I’ve recommended this to have seen a huge improvement and they notice the difference when they go without. How do you know if you’re deficient and how much should you supplement? If you’re consuming magnesium tablets, you can start with 200mg increasing until you reach bowel tolerance. You’ll know when this is! I find it best to take this in the evening prior to sleep to help with the relaxing effect. Magnesium truly is a magic mineral that I encourage everyone to try out and incorporate into his or her everyday life. Juices are a great addition to a healthier diet. I love them for a good dose of potent nutrients delivered in one go. There’s so many different kinds you can make. Often it’s easier to start with one that’s a little sweeter. I was a bit ambitious when I first starting experimenting with juicing and made my first batch with only veggies. Needless to say, it wasn’t very pleasant! If you can manage pure veggies that’s amazing but I find it’s best to start with a small amount of fruit added in to take the edge off. This one is a really great juice to start with as it’s sweeter than a green juice being mainly fruit based. The ginger adds a nice kick as well. It’s perfect to add to a weekend brunch! 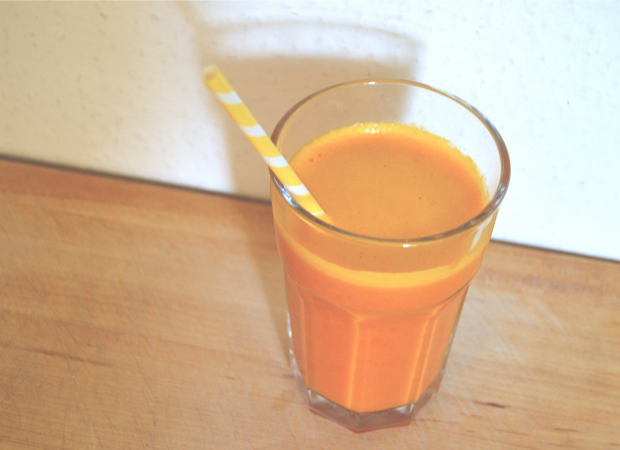 Add everything through the juicer and enjoy. I like to refrigerate mine for a few minutes so it’s a bit more refreshing. Drink within 24 hours so you retain all the best nutrients.